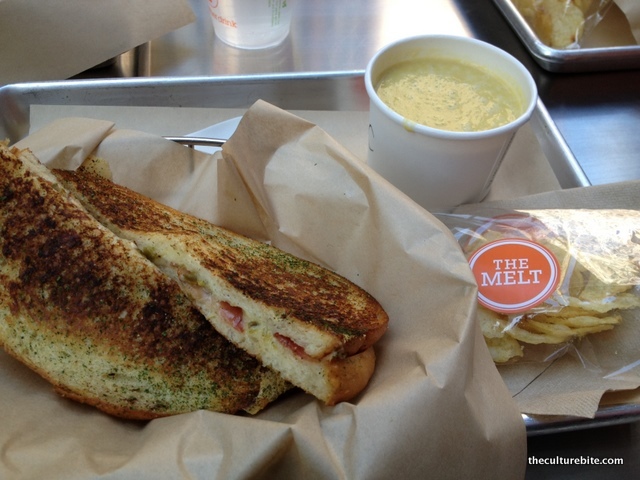 The standard at The Melt is to get a combo – a sandwich, soup and a little bag of chips. They have some set combos on the menu, but you can also create your own. I ordered The Mission combo, jalapeno jack cheese on sourdough with a sweet corn tortilla soup. The sandwich was warm and gooey in the middle and crispy on the outside. It’s obvious they’re not afraid of butter. 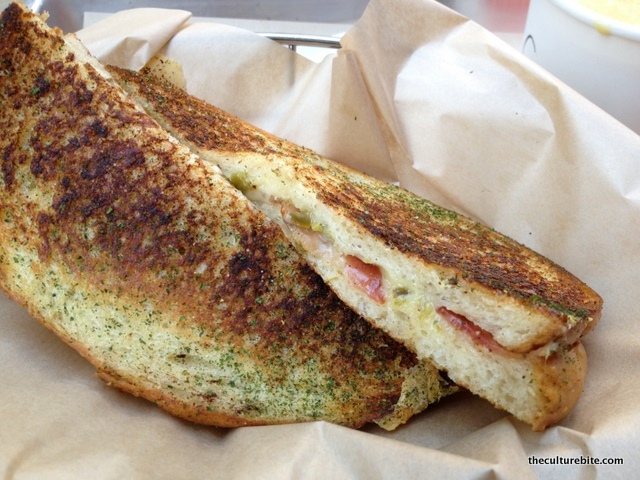 The spice from the jalapeno gave it a good kick to break up the richness of the sandwich. The soup was thick and sweet with a smooth consistency. They seemed to have thrown in all the ingredients and pureed everything together which I was not a fan of. There were no kernels of corn in the soup and I didn’t sense any tortillas in there either. I would have appreciated a more hearty soup with identifiable ingredients. Overall, I think The Melt is a solid 2 clubs. Their selection of sandwiches aren’t too creative and the soups are disappointing. However, if I were to rate on taste alone, I would definitely choose The Melt over the American Grilled Cheese. I haven’t tried it yet…not sure if I will!